I also have to say, if you are using a Mac and want to switch to Ubuntu it is pretty easy. You don't have to do all the extra stuff I am doing and learning, so don't let some of the comments people are writing scare you away. Oh I loaded some more pics today using the same method as before. This time I picked the picture folder and I didn't get any errors and it worked..:) I like this and the kinks are being worked out quicker than I thought. :) So F-spot is working for me and the error I got was not the software's issue but mine. Figured how to fix my touch pad issues. By going to System, then preferences, then mouse, from there clicked on the touchpad tab and set it up for what I like. Now I am staying with the touchpad and not grabbing my trackball. 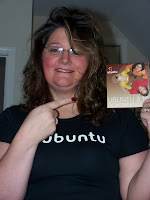 I just got added to Planet Ubuntu Women...I am so excited, and learning so much. I feel a little slow though. Learning beyond the easy "out of the box" stuff. I can do almost all the regular stuff I want to do without extra stuff. Now I want to learn more. The women (and some guys) in the #ubuntu-women, are great at helping me. I was asked about my suspend resume issue, so far when my computer goes to sleep it comes back now, and since I installed the updates (with the funny names), as they are made available, I still have to suspend the machine, put it into hibernate mode to see if I still have issues or not. To answer one of the questions that was asked of me, since I installed Ubuntu on a machine that had nothing else on it, I think it happened "out of the box." However after I installed it I did not suspend/hibernate etc...before installing the 247 updates etc., so I have no idea when/where the problem can from. Nor would I as the average mom user care as long as it is fixed or doesn't bother me enough to "squeak" about it. Also in regards to Mac regressions I have never gotten a hold of a bad Mac install and had to undo an Install. So I can't speak as to how I would do that even if I needed to. I have never needed to. About BitTorrent, I was going to download Fedora 10 and Blow away my Macbook Air and install in there, but Air doesn't allow boot from USB and it has no CD/DVD drive I scrapped that idea. I think it can be done, but it is way over my head, so the ease of installation would be skewed. I found the extra drives and I will be trying Fedora 10 soon. I still have a few more things to read about and try with Ubuntu 1st. I learned that BitTorrent is a way to transmit large files easily across the Internet. I found it was already installed and read up about it. I can use that. Will try soon enough. OK my morbid curiosity got the better of me. I looked up Fedora Project at FedoraProject.org and found what I needed to download. This time I had to ask Pgraner for help. (Sorry Fedora guys I just didn't know) I had to figure out which download I needed and had no idea what the guts of my computer are. It said Get Fedora, so I clicked it. KDE Fans go here...I knew that wasn't what I wanted as I am just now using GNOME, so then there was a window that said , Have a PowerPC go here, I asked Pgraner do I have a Powerpc, nope I don't. So then I had to go Show me all download options on one page. After going there I had to ask Pgraner again, which one. I knew I wanted one under the BitTorrent column, and was told pick x86_64. So did. Started the download about 10am and it is now 2:24pm. I know you wondering what our bandwidth is here so I asked. We have a 12mbit data line here. Now I know I like media over downloads and to be fair Jef. S, did tell me where I could go to get a DVD sent to me. I just got impatient and wanted to try BitTorrent and see how this downloading works since I was told it should be easy to do. 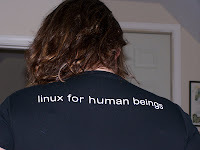 As of this posting that's about all I can say about Fedora 10. Other than it looks like it would look cool once it's installed. Monday will be Januty testing day, and I can't wait to participate in it. Again, average user doesn't have to do this, but once I started learning about all this stuff I couldn't help but want to know more.